The earthquakes on April 25 and May 15, both above magnitude 7, and continuing aftershocks in Nepal, which were also felt in India, have intensified the debate on structural safety in the subcontinent. HT Estates, which has regularly reported on the state of buildings in India and the need to retrofit and reconstruct damaged or weak structures, once again underlines the importance of knowing more about earthquake resistance grades of buildings. In India 100% of the buildings, including hospitals and high-rises, are designed and built only to the collapse prevention standards. This level is for buildings, the contents and utilities of which, when shaken severely, suffer major damage. The building does not have any additional reserve capacity, is in the state of imminent collapse, and cannot be used after the earthquake. As the buildings in Nepal too were designed and built to the collapse prevention standards these suffered extensive damage. “If you read the definition, the damage is said to be beyond repair,” Shah explains. Important buildings and high-rises have to be built to ‘immediate occupancy’ standards. This is defined as a building, its contents and utilities, despite being shaken predominantly in their linear range of behaviour, sustain only minor damage. The use of prevailing functions of the building and facilities is not restricted after the earthquake so that its functioning can be resumed immediately after the earthquake. 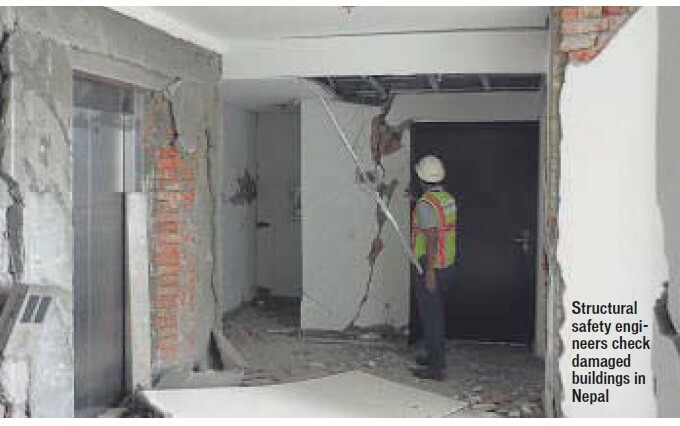 Difference of costs between ‘collapse prevention’ and ‘immediate occupancy’ is approximately `350 per sq ft. There are two main Indian seismic codes, of which IS-1893 has not been updated for 13 years and IS-13920 has not been updated for 22 years. the building, its contents and utilities being shaken by an earthquake, no damage occurs; the function of the building is not disrupted due to the occurrence of the earthquake. upgrade without waiting for another earthquake to strike. “It is also much less expensive and safe,” he adds. Efforts to get a reaction from Noida Authority proved futile. ←San Andreas: Hollywood Hype or Real Risk?